Love for Leah, a benefit for a young girl from Trevor struck in a car accident in Illinois this summer, will be held Saturday, Nov. 10 from 3 to 7 p.m. at Parkway Chateau, 12304 75th St, Kenosha. 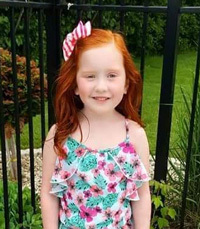 On Aug. 10, 5-year-old Leah Dinchak was tragically struck by a car while walking to Lindenfest with her mom. Leah was flown Flight for Life to Advocate Children’s Hospital in Park Ridge. Leah was diagnosed with a traumatic brain injury, pulmonary contusions, and a very serious spine injury. She is fighting her best fight, with mommy and daddy by her side every moment of every day. Saturday’s benefit will include 50/50 Raffles, Bucket Raffles, Vacation raffle. $10 entry donation includes food and live music. More information including how to make a donation is available here.